AMD has shown serious resilience on the desktop side in the past year and now, the company is taking on Intel in the laptop department. 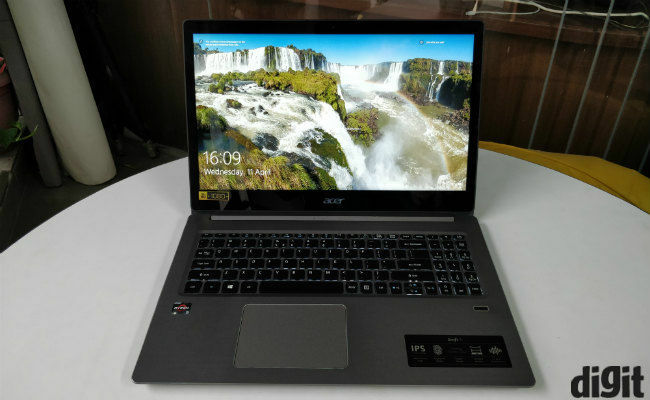 Laptops powered by AMD’s latest Ryzen mobile processors have started to make their way into the Indian market and we were lucky enough to get our hands on the Acer Swift 3 powered by the Ryzen 5 2500U processor. This new four core, eight thread chip is a worthy competitor to the Intel Core i5 8250U. 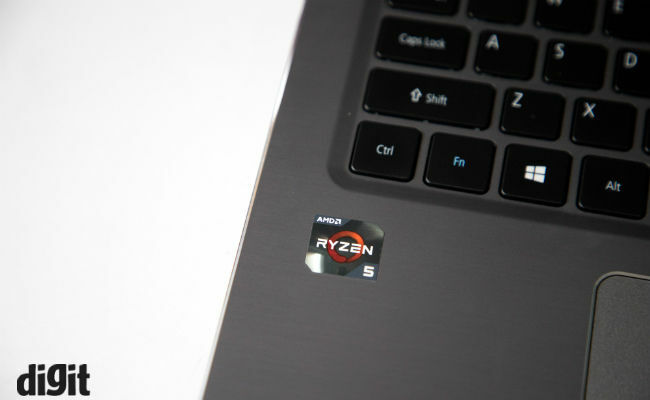 We recently ran some performance tests on the Acer Swift 3 powered by the Ryzen 2500U and results suggest that it provides comparable performance. However, what about the laptop itself? Is it any good? We take a step back and focus on the new AMD Ryzen powered Acer Swift 3 to find out how this machine performs. Here is our full review. Like the 14-inch Acer Swift 3 we reviewed earlier this year, this 15-inch variant has pretty much the same design and build quality. The machine features an aluminium shell with a brushed metal finish which feels quite premium. There is minimal flex in the machine and to give some sturdiness to the display panel, Acer has added a glass panel on the front. There is some minor flex in the keyboard deck, but it does not hamper the typing experience. This 15-inch version also has the same design detail of chamfered edges around the lid and keyboard deck, which looks nice and does not cut into your hands when you carry the device. Even though this is a big 15-inch laptop, Acer has kept the weight considerably low at 2 kilograms, which though not the lightest, it is still a tad lighter in comparison to most 15-inchers of the past. There is no maintenance hatch on the machine and opening the back is a chore as it requires a certain amount of prying and broken nails if you don’t have a laptop opening kit. Nevertheless, even if you manage to open it you only get an upgradable M.2 storage bay. The 8GB RAM is soldered on the motherboard itself and can’t be upgraded. The AMD APU is cooled via dual heat pipe system attached to a single fan venting out at the back. The fan remains relatively silent under normal load, but one can hear it whine under full load. The 15-inch TFT panel is of a similar quality as we saw on the 14-inch Intel variant we have already tested. The colour fidelity is good enough for a 40K machine, and the display offers usable viewing angles even with that reflective glass front. We appreciate that unlike last year, more and more laptops are now offering a 1080p resolution even on the base model, and this one is no different. Though the 15-inch display seems relatively sharp, the brightness is certainly on the lower side. Like the display, Acer has done a good enough job in the I/O department. On the left side you get an HDMI port, USB 3.1 Gen 1 Type-C port, two USB 3.0 ports and a microphone headphone jack combo. 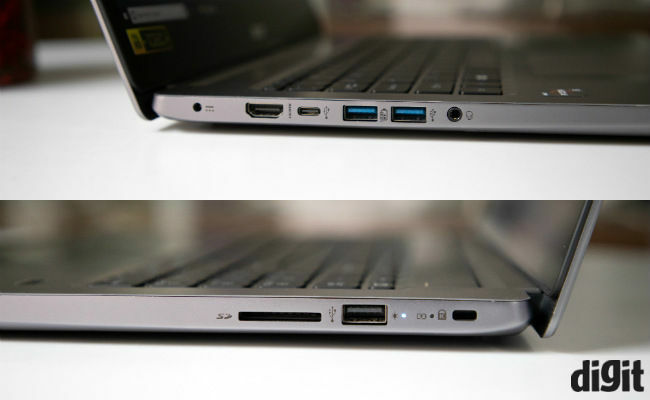 On the right, the laptop features an SD card reader and a USB 2.0 Port. While this certainly is more than what you might get on a smaller laptop, the ethernet port is noticeably missing. That said, the humble ethernet jack is slowly disappearing from laptops completely. There are other things which Acer could have done differently. For example, the USB 2.0 on the right side, could easily have been a USB 3.0 port and instead of powering the unit with a barrel port, we would like to see companies adopt the USB Type-C standard for power delivery, at least where system TDP is not likely to exceed 100W. The keyboard and touchpad experience of the laptop is satisfactory. The keyboard offers chiclet-style keys which press down with a low clicky sound and may feel spongy at first, but with time will grow on you. The keys have a short travel, although they are still better than the Apple MacBook 12-inch keyboard. All said and done, the keyboard still has the same issues we pointed out on the 14-inch model.The page down and page up keys are still squeezed in with the arrow keys, which makes pressing either of the keys a challenge for touch typists. The top function key row is also a bit small compared to the rest of the keyboard which makes the keyboard look cluttered. However, the worst part is the lack of any volume or media controls on the keyboard and the absence of two-stage backlighting. We like the typing experience Acer is offering, but keep in mind that it is a budget laptop and the only better keyboard around the same price is on the Lenovo Ideapad 520s. That said, you won’t find the experience straining during long typing sessions and there is plenty space for your hands on the keyboard deck to accommodate working at odd angles. 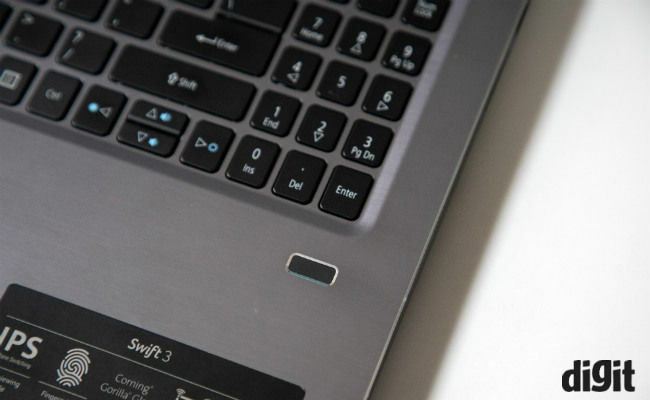 Below the keyboard lies the big smooth touchpad, which offers the same experience as the one we used on the 14-inch model. You have a matte-ish surface to work on and it tracks well without any issues. We did not find any issues using Windows 10 gestures and since Acer has employed Windows precision drivers for the job, it should get timely updates if Microsoft adds more gestures to the mix. As for the two left and right click buttons at the bottom, they work well and press down with a small audible click. 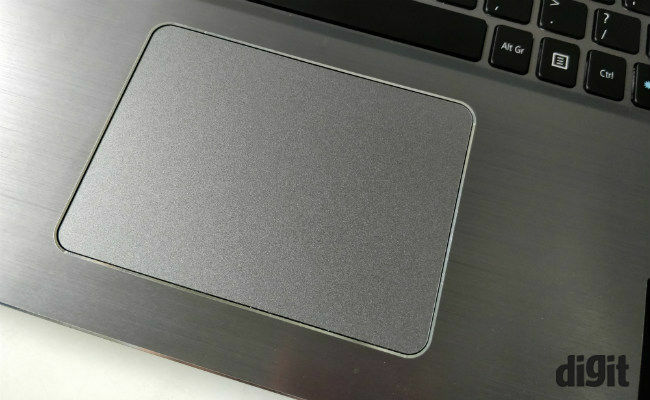 On the keyboard deck, you also get a swipe-style fingerprint scanner which is neither that precise nor fast. 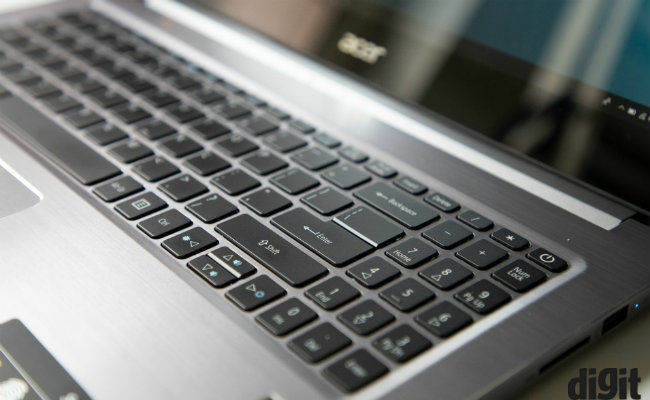 We would love to see Acer shift to a touch type fingerprint scanner soon. As mentioned earlier, this Acer Swift 3 is powered by the latest quad-core AMD Ryzen 2500U processor. On paper, this new 15W chip is similar to its Intel counterpart, the Intel Core i5-8250U. However, it has a lower boost clock speed (single core) than Intel’s, which translates into a slightly lower single core performance. However, in multi-core performance (Cinebench R15), the processor posts a better score. On this particular machine, the performance is not evenly matched by the much slower 1TB HDD drive from Western Digital. Hence, it ends with a lower score in PCMark (acc) compared to its Core i5 counterpart. Considering day-to-day performance there is hardly any difference in performance apart from the slower hard drive. That said, it is hard to expect a 40K laptop to feature an SSD, considering the astronomical prices of flash memory recently. 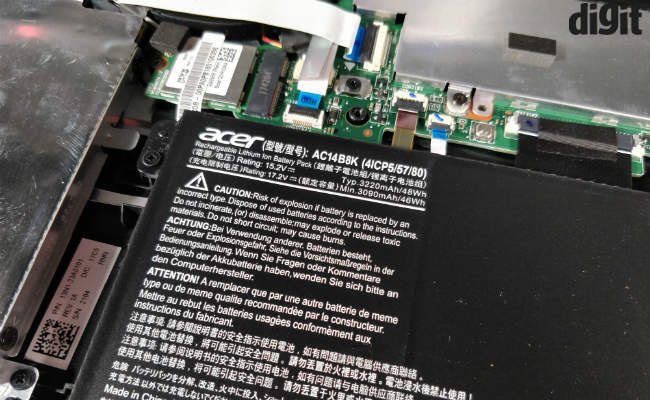 The laptop can be pushed to its limit and it never becomes too hot as Acer has set the thermal envelope around 76-degree Celsius, a threshold the chip didn’t exceed during our tests. There is some minor throttling at full load to maintain temperatures, but it does not have a noticeable impact on the performance. That said, Acer could have designed a better thermal solution for the laptop as the Ryzen processors can offer better performance as they offer configurable TDPs (higher than 15W). The best part about the new Ryzen processor is the integrated Vega GPU, which outperforms every other integrated GPU currently available on laptops (in India). The chip pushes almost double the scores compared to UHD 620 in more than one synthetic benchmark. However, this still does not mean that you can play latest AAA games on the laptop. That said, the Acer Swift 3 or any Ryzen 5 or higher powered laptop should not have any issues running casual esports titles such as Dota 2 smoothly. It uses about 1GB out of the 8GB DDR4 RAM as dedicated memory and can use more if required. The biggest issues with previous AMD powered laptops have been the heat emissions, which seem to be a no-show here. The single fan with dual heat pipes seems to do the trick. That said, keeping the TDP lower at 15W also plays a part. It runs quite cool under normal day-to-day load and only cranked up the heat only under our rigorous stress testing. All things considered though, the laptop never becomes too hot to feel uncomfortable, which is a big achievement for AMD and partly Acer. Of all the things that are impressive about this laptop, the battery life is just about average. The 48W battery provides decent 4-5 hours of usage for the day-to-day workload, which is nothing great. If you end up binge-watching a series at full brightness, you might see even lower battery numbers. This is certainly a bummer for some, but for anyone buying a laptop at the 40K price bracket, there are not many machines which perform better. All-in-all, the Ryzen powered Acer Swift 3 is a complete laptop, covering all the essentials but nothing more. The laptop’s performance, display quality, keyboard and touchpad and even the I/O selection falls in-line with its peers. 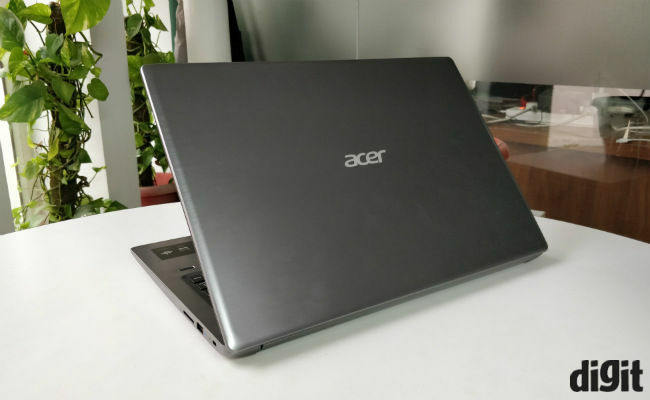 We feel, the battery life is pretty average and the keyboard though functional could have been better, all things considered, Acer does provide a pretty good package for the price. 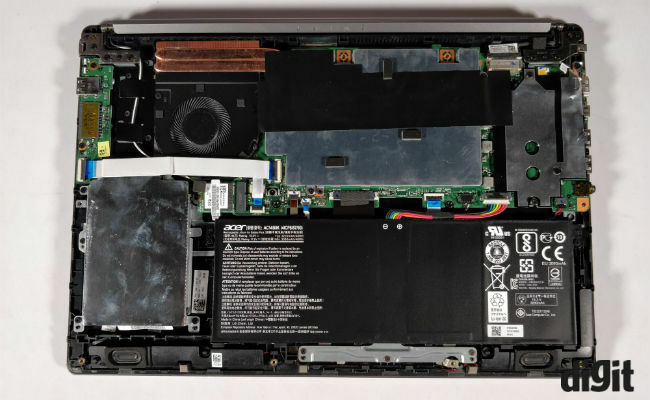 We do believe that adding an SSD to the mix might have given the laptop a more promising performance, but that might have compromised the pricing. The laptop has two main competitors, one is the Lenovo Ideapad 520s, build quality of which is inferior to this machine and then there is the HP Pavilion 15, which offers a GPU, but the last gen processor and just 4GB RAM.